Here's why the tree sometimes has a bad reputation--its infamous hard spiky gum balls.... This fruit turns from green to brown as they ripen during the fall. When they start dropping to the ground in late winter they can become a major annoyance to some and at times cause pain or bodily injury, i.e. 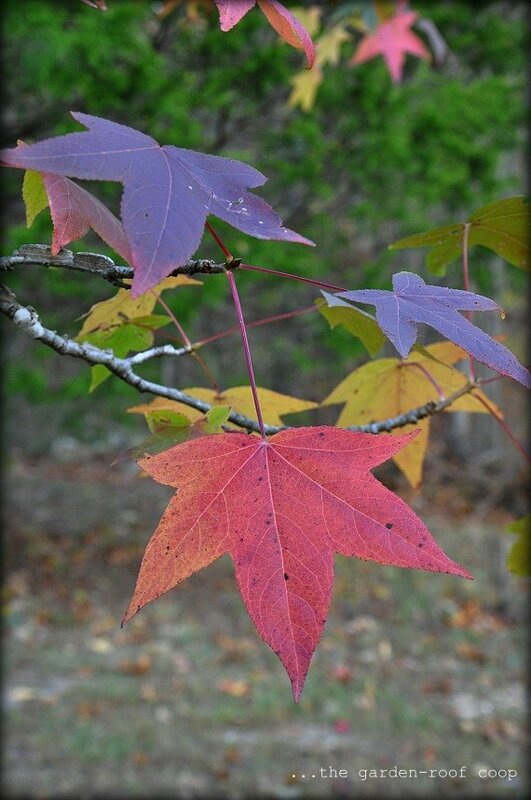 don't walk barefoot under a Sweet Gum tree. they don't appear until the tree is 20-30 years old! A lovely tree Becks, perfect for the birds. I can imagine standing on one of those seed balls - ouch! Very pretty fall color tree! I don't think I've seen these in upstate NY where I live but that doesn't mean we don't have them. Thanks for taking part again in the Shades of Autumn Photo Challenge! The colours of those leaves are amazing! I don't think I've ever heard of this tree before. We have three Sweet Gums growing in our yard. I won't say they are my favorite tree, but hey, a tree is a tree and I'm not going to cut them down just because they don't happen to be a walnut or oak. The Sweet Gum out by our garden is a magnificent old shade tree. Of course, I cuss its roots for intruding into some of our garden beds, but I'm not going to remove the tree. 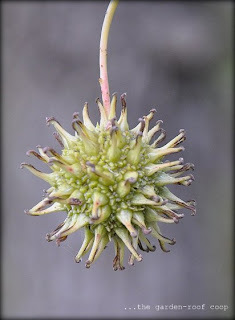 I had no idea it took a Sweet Gum 20-30 years before it produced Sweet Gum balls. 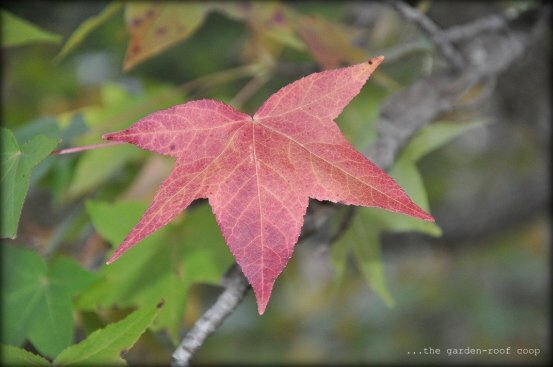 Have you ever heard Sweet Gum seeds fall? It requires a very special day in early spring – unseasonably warm, sunny and the gentlest of breezes. 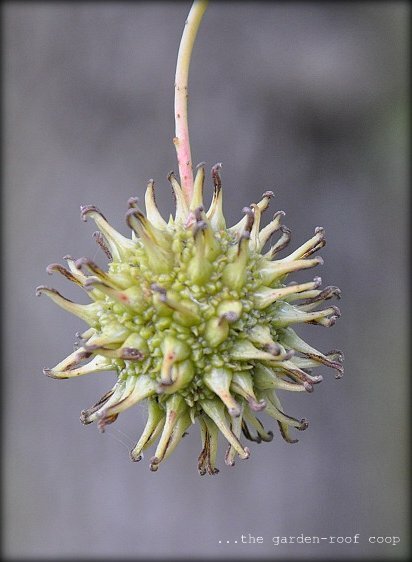 The Sweet Gum balls open and the tiny seeds within fall to the ground producing a very faint “sizzling” sound. Most years the Sweet Gum balls open on a sunny and windy day and the sound of their falling is drowned out by the wind. Unbelievably lovely. Purple leaves? Wow! 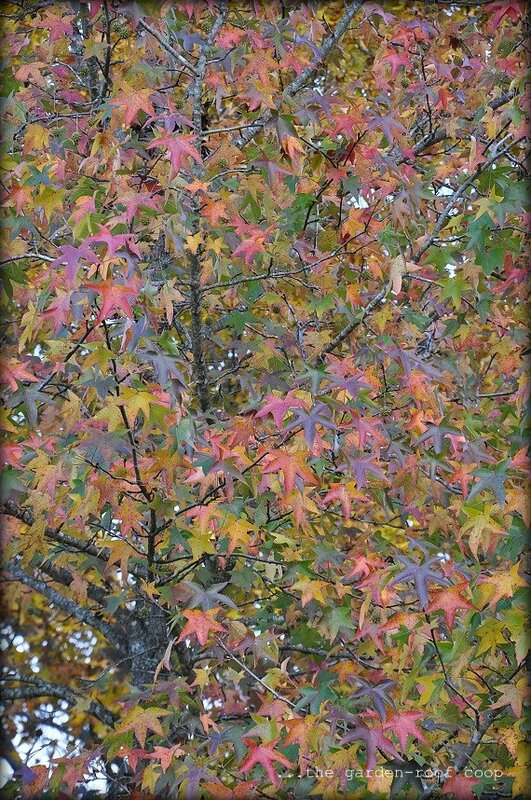 This Sweet Gum Tree is a work of art!